Rent Sheraton Jacksonville Hotel | Corporate Events | Wedding Locations, Event Spaces and Party Venues. Explore one of the finest Jacksonville hotels- the Sheraton Jacksonville Hotel, ideally located in Deerwood Park and less than 1 mile from popular shopping at St. Johns Town Center Mall. 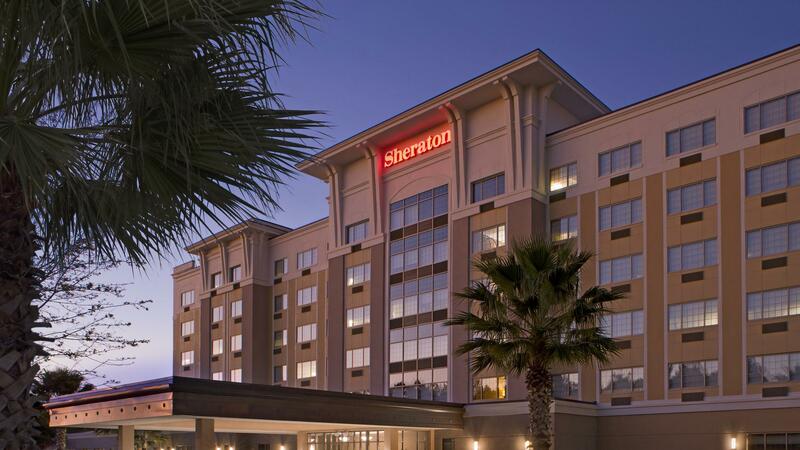 The Sheraton Jacksonville Hotel is perfectly suited for leisure and business travelers alike. Welcome to the all-new Sheraton Jacksonville Hotel, located in the lively Deerwood Park area—just minutes away from Jacksonville attractions. Find total relaxation in our 159 beautifully-appointed and updated guest rooms, complete with wall-mounted HDTV flat screens. Start your day with in-room Starbucks Coffee® and end it by experiencing the celebrated “ahhhhh” of our Sheraton Sweet Sleeper™ Bed. Stay connected to what’s important with two phone lines with voicemail, and High Speed Internet Access. Stop for a while at the lobby’s new Link@Sheraton experienced with Microsoft, a truly comforting space offering High Speed Internet Access, PC workstations and printing capabilities. Work off some energy in our fitness center, then experience a refreshing change of pace in our indoor pool. With over 14,000 sq. ft of indoor and outdoor meeting & event space, our flexible rooms can accommodate up to 300 guests. Nothing makes a wedding celebration more special than the attention to detail and personalization that the Sheraton Jacksonville Hotel offers each guest. We take pride in making sure every detail of your Jacksonville wedding is taken care of, from the beginning of the ceremony to the end — that’s our commitment as one of the best wedding venues in Jacksonville.